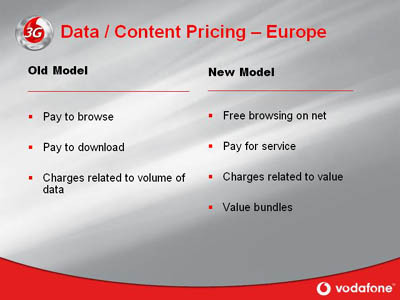 I'm currently watching Vodafone's 3G Launch Webcast and it's very interesting (if you're into mobile services). Seeing first-hand what the world's largest mobile operator with 150 million customers is planning for its future 3G services is pretty neat. And these guys seem to be very realistic and focused. They're not just throwing stuff out there to see what sticks, they've got a clear set of services, a unified message, a solid set of phones, and a clear direction. In other words, I'm not seeing 3G hype here (no mention of LBS for example). They even started out the presentations with a caveat along the lines of: "I know you've been hearing about this stuff for years, but it's here for real now and we're going to prove it to you." I may need a few days to mull over the presentation - there's just so much to digest. Lots of interesting side comments like "we've reached parity with Japan's services," "over 100,000 3G data cards in a few months," "we've learned from American CDMA" and bragging about using their size to demand manufacturers develop exclusive handsets. Analyzing Voda's stategy will take a bit as well. They've separated the Live! branding from the 3G service. It's "Vodafone Live! Powered By 3G", not just "Vodafone 3G". Instead of talking about revolutionary new products, they're talking about evolution: Ringtones to full music recordings, games to 3D games, and photos to video. They do have a few new services as well, including Video Calling and Mobisodes, but again, with the caveat that the package of services is what's compelling, not any one app. 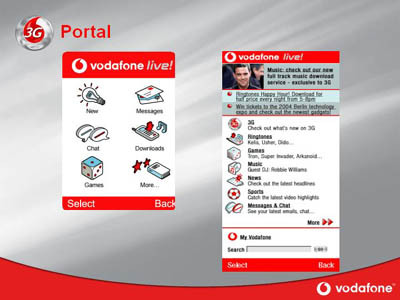 The changes to the Vodafone Live! home page are incredibly interesting. They ve gone from the Series 60-like navigation icons to a list of services with space at the top for promotion and a *search* field as well. They've obviously using XHTML-MP now to present their portal instead of plain WAP, and are expecting users not only to want to search, but be able to type a search phrase into their phone as well. This is a huge leap from American "read-only" portals that I've seen so far. It's *very* interesting and validates many of my theories of the future use-cases for mobile phones. (I've got a demo service I've been showing people, and the search field is at the top of the page - assuming like Vodafone that people will want that feature). The new data pricing model is interesting as well. The free browsing of Vodafone Live's web site is particularly devious. As was explained in the presentation, the old model was like being charged just to walk into a store, then paying by the weight of your purchases. Now users will be able to browse Voda's site for free - not external sites, by the way, I had this confirmed - then you pay for data you may download by their "value", i.e. not by their KB and you may even get bundles on a monthly basis like x number of ringtones, etc. AHhh!! I get it now! This is just another version of the walled garden! Do you see it? If you're a consumer and you can get your news from Vodafone's news section for free, or from BBC's mobile site at $10 per megabyte downloaded, which are you going to use? This is a way for Vodafone to lock in their customers to their portal, charge obscene amounts of money for data by calling them products ($3 for a 6kb ringtone? Sure! ), and make sure there's a heavy "data-tax" on any outside competing services, all while claiming to be open. It's pretty brilliant. Who will want to use the open data services? Well business users of course! So business users will pay higher charges (as they always do) and regular consumers will pay less, but still more than they used to, but it all seems much more clear and fairer to customer. Watching Voda make it clear that they're going to own the customer completely is pretty amazing. Are you Nokia? You better put our logo on the phone and our menu on the screen. Are you Yahoo? Don't even think about providing data services, we own the portal and we own the data access charges. Are you other carriers in Europe or Asia? Watch out, because we're going to market you into the ground. Are you Apple? We've got deals with every major music publisher and are offering music downloads, so your iPod is toast. It'll be very interesting to see how this plays out over the next few years. I *really* wish Vodafone had bought AT&T Wireless instead of Cingular, it'd be great to have a lot of this stuff available here as well. Anyways, there may be more later as I digest the presentation.